Occasionally, car problems will arise – that’s Sod’s law. Fortunately, there are some essential tools you can keep in your car for times of trouble. Be prepared for the worst by keeping your vehicle maintained and serviced, but if all else fails there are some safety measures you can take to ensure you are well-equipped if you car breaks down. Below, we have compiled a list of essential items to keep in your car. This emergency car equipment list can be used if you find yourself stranded. 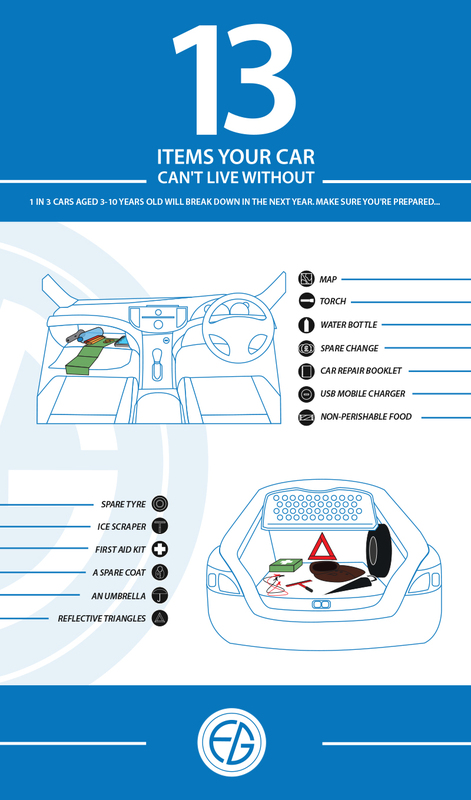 Be a smart driver and follow our infographic to put together your own essential tool kit to keep in the car. Take matters into your own hands with your own pair of jump leads! It’s best not to rely on passing drivers to be in a position to help you with a restart. If you are miles away from a garage, cables will be essential when it comes to getting your car back on the road. It’s probably best to familiarise yourself with the engine beforehand so that you’re prepared to use your jump leads correctly. Documentation on car repair should already reside in the glove apartment (be sure to check). If it doesn’t, ensure that you replace or obtain this information as soon as possible – you never know when a red light might start flashing! Keeping this to hand will help you to better understand your car, and to identify and fix problems sooner. While this device is not a necessity, it is still beneficial to keep a USB mobile charger in your car. If your phone battery were to die during a breakdown, would you be in a position to contact help? With a charger to hand, you are safe in the knowledge that you can make contact without having to walk to the nearest phone box! Additional tools include a wheel lock, alignment studs and extension bars for lowering the spare tyre. Items such as cereal bars, crisps and bottled water will keep you replenished and probably less agitated if you’re waiting for roadside assistance. You’ll be grateful if and when the time comes. Whether it’s for toll payment, car parking or payphones, having a little loose change always comes in handy when you’re on the road, so be sure not to leave yourself short. Be prepared for dealing with an emergency situation. Whether you need to attend to a bleeding cyclist, apply emergency plaster to an injury or clean an infected wound, your journey will certainly be filled with less worry knowing there is a first aid kit to hand. If you break down and need to inspect your car engine, how will you be able to clearly see what you’re doing? Ah, yes the magic of the torch! An incredibly useful item, especially in winter emergencies. We can’t all rely on the beauty of smartphones, and a good old-fashioned map can be a lifeline and saviour when your sat nav crashes. Don’t underestimate the power of print when technology may fail you! Keeping a spare coat in the boot is always a good idea, whether it’s to sit on when you have a spontaneous picnic or to wear when you’re turning blue from the cold shivers of the winter months. You can’t get anywhere with frost- covered windows in a hurry, which is why it’s more than wise to keep your car safe and yourself well prepared by carrying an ice scraper with you at all times during winter. Running from your car to your office door in the pouring rain isn’t ideal, neither is walking a mile to the nearest station in the rain because your car broke down – but it could be made just that little bit more bearable with an umbrella. Keep one in your car to always be prepared for a heavy shower in an unexpected situation. A reflective triangle stops you from getting hit on the side of the road in the dark, therefore it’s pretty darn essential for ultimate safety precautions. We are Exminster Garage and we specialise in MOT and car servicing. We work to assist the residents of Exeter with automotive tips, advice and unsurpassed customer experience. If you have any essentials that you keep in your car and they’re not listed here…. tweet us and let us know what they are! This entry was posted in Infographic, Top Tips. Bookmark the permalink.